It's actually interesting, because Job's complaint about "wearing out" the Apple logo with over-exposure is a well known problem in design… and, well, propaganda, too. Just to be correct, because fanbois are easily upset: I'm in no way comparing Apple's marketing to 3rd Reich propaganda, instead I'm trying to show that Jobs made a very good call here: it's a well-known problem, an old one at that. You lose the power of your symbol, its special meaning, and recognizability. That, and it got tiring to explain to customers to "press Command+C to copy" only to hear back "Command? Oh, the Apple key?" This is not just used in Northern Europe it is sometimes used on American maps to indicate places of interests when there is already a heavy amount of key symbols used. This is a great read and its no surprise Susan Kare referenced a international symbol dictionary, a mark of a true designer using a recognizable and readable symbol for a very important command, a true genius. If you swap out historic with place of interest to "copy" it makes a lot more sense. I wish people would take this care in designing symbols today, I've seen some freakish ones as of late on mobile phones, and especially touch devices. Have we forgotten a touch button is still a command button? I can see how you would connect it to a campground, but actually, in danish and swedish, its the sign for a Historic site. Thats also the reason why ppl find it very very wierd in scandinavia.. why to copy a file, do i press "historic site" + c??? Officially "Sevärdhet" ("Place of interest") in Swedish, doesn't have to be a historic site. Same in Norway, and I assume this is how these signs are used throughout the Nordic countries. "Severdighet" could also be roughly translated into "tourist attractions", as they are mostly used for that. I actually think it would help in teaching about the key combinations. I think I will use this story next time I do an intro to the Mac class. The symbol is used in Finnish traffic signs as well, with the same meaning as in Sweden - place of interest. I am surprised Apple didn't sue Finland for copyright infringement. Although I question whether a special symbol is even needed. The key in question already has the word "Command" written on it. Adding the symbol seems redundant and confusing, especially since it is not a universally known symbol. And the drop down menus could easily use an abbreviation, for example, "Cmd+Q" instead of ⌘Q. Especially when used in combinations, I certainly find it a lot easier to read something like "Cmd+Alt+C" instead of all the little symbols jammed together. I use the same keyboard, monitor and mouse with my Mac and my Windows machine. To make it easy to switch between them, I have a KVM switch. My keyboard is a Windows keyboard. Until now, I had wondered why my KVM switch maps the Windows key to the Mac's command key. 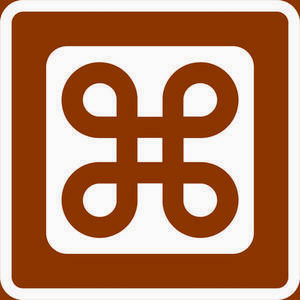 Now I know: The Mac commmand key used to be an apple... the Microsoft logo maps to the Apple logo (historically). Small technicality: It isn't your KVM that's doing the mapping, but the OS that's interpreting the key this way. I believe the keyboards send the same signal. Now that's weird; I wasn't even aware that the apple symbol had been removed from the apple key. Both my apple keyboards (one on a IIci, and one on my ~2004 Powerbook G4) have apples on them. I wonder why they removed it. EDIT: according to wikipedia, they removed the apple to make space for the word "command" (or "cmd" in Europe). Makes sense, I guess. The original Mac had no Apple logo on its command key. They added the Apple logo some years later and it stayed there until 2007 when it was removed. They added the Apple logo when they introduced ADB - both Macintosh and the //gs used the same keyboards. I guess this means we actually have three ways to describe a keyboard shortcut: Command + C, Open-Apple + C, Campground + C.